The body is a complex organism that still has mysteries to unravel. But the information that has been discovered, people are able to better care for their bodies by abandoning certain foods and lifestyles in favor of healthier ones. Today, we can look at the signs our bodies show us and make the necessary changes. For example, rosy red cheeks have been a sign of vitality, youth, and beauty for centuries. And while that still holds true today, sometimes red cheeks can be seen as undesirable and even cause self-esteem issues due to people mistaking you for embarrassed or shy and treating you as such. Life at school or work can be difficult when you are pigeonholed into a first impression. Learn how to get rid of red nose and cheeks and improve your self-image. Red nose and cheeks can be caused by dryness, sun damage, temperature, allergies, alcohol, or as a reaction to a product that you have used. Wind damage can dry out your cheeks, chafing them and unprotected sun exposure can damage your skin cells as well. Dry skin, in general, tends to crack and can even become inflamed. Extreme cold or heat temperatures can chafe and dry your cheeks, irritating it and turning it red. The consumption of alcohol can cause a flushed face in some people due to the body’s inability to efficiently break down a chemical, acetaldehyde, released by the alcohol. The blood vessels constrict and your face turns red. This condition, if frequented often, is usually a precursor to high blood pressure which would also increase redness in the face. There is a skin disorder that may also be the culprit at the center of your red cheeks. Rosacea is chronic and can have a detrimental impact on your quality of life. It is usually observed in adults age 30 and older but it isn’t limited to them. The disorder comes and goes in cycles from outbreaks to remission. 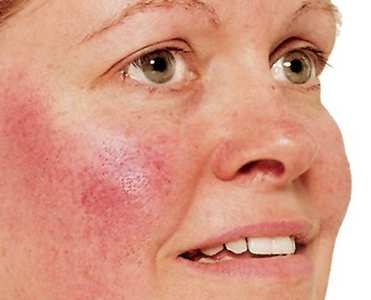 The symptoms that characterize rosacea are redness of the nose, chin, cheeks, and forehead. It has also been known to flare-up in the scalp, ears, chest, and neck. If left untreated, the condition may worsen result in more severe symptoms, redness, longer outbreak cycles, and the appearance of visible blood vessels. Pimples or bumps may develop creating excess tissue and scar tissue. This can lead to exaggerated facial features that appear swollen and bumpy. If you suspect that your red cheeks may be rosacea, talk with your medical provider for therapy options. It is not exclusive to a particular to any certain portion of the population, although people of fair skin tones are thought to be at higher risk. And moreover, men tend to exhibit more extreme cases although it is more often a diagnosis of female patients. Rosacea is not known to have a cure, but there are steps you can take to reduce and control the symptoms. Knowing how to get rid of red cheeks and nose can revamp your mornings and leave you feeling more confident. More mild cases of red face are due to diet, the products used, and/or the skin condition. Most of the time, the redness can be corrected by moisturizing the area, reducing inflammation, and soothing the irritation. Oatmeal is known for its intense moisturizing properties. This also helps to soothe the delicate skin on your face. To use oatmeal, mix 1/4 cup of plain oatmeal with hot water. Allow the oatmeal to cool before applying it to your face. When you apply the oatmeal, don’t scrub or rub. Simply place the mixture, juice and all on your face, wear it like a mask. Leave on for 15 to 20 minutes before rinsing the face. Follow up the treatment with face moisturizer with SPF protection. Aloe Vera is used for its soothing qualities, healing properties, and its moisturizing activity. Fresh aloe vera is best to reduce red cheeks. Cucumbers are known to help reduce puffiness of the face and around the eyes. That’s because of the ascorbic acid that reduce inflammation. You can also use it for redness. Slice up a fresh cucumber and apply a slice on your skin. Slide the cucumber around but don’t rub. Cucumbers are also a great source for vitamin C. This vitamin also helps to repair your skin and reduce redness. It is soothing and the aroma is relaxing. Leave the cucumber juice on your skin for 5-10 minutes before rinsing it off and following up with a moisturizer. Not all oils are made equal, but for getting rid of red nose or cheeks, coconut oil, vitamin E oil, tea tree oil, and castor oil work wonders. Coconut oil helps correct the dry skin because it contains a high volume of lauric acid which is also antimicrobial. You can apply the oil at night while you sleep. Vitamin E revitalizes the skin as does tea tree oil. Castor oil is just as effective and can help to reduce the appearance of scars on the face from rosacea or even eliminate them altogether. Mint leaves and products containing mint will reduce inflammation. It’s also an astringent which means that it tightens the skin and pores. To use mint for red cheeks, add 3 mint leaves to a cup of boiling water. Allow it to cool before using it. You can mash the leaves and apply them or you can just use the juice. Let it sit for 5 minutes before rinsing it off. Mint helps to reduce acne and with time, can lighten blackheads as well. Milk has always been soothing from sore throats to upset stomachs (unless your lactose intolerant). You can reduce irritation and red cheeks simply by using a rag to apply chilled milk to the affected areas. Frequently an allergic reaction to something you’ve eaten, or something you’re using can cause redness of the face. To check if this is the case, you can start with either category. For products, begin by removing anything that could be an irritant. If your skin responds by normalizing, then reintroduce a product at a time, paying attention to whether the product causes redness. If you find that a product is producing the reaction, discontinue its use. To test the foods you consume, keep a log of the foods you eat and the hour when your face is the reddest. Salt can dehydrate the body and lead to puffiness and redness of the face. Many processed foods and fast foods are high in sodium. Keep this in mind as you track your foods and pay attention to the fluids you put in your body. Alcohol and caffeine dehydrates your body. So if you consume a lot of these types of drinks and not enough water, your red face could be caused by the dehydration as well. After a week or two of taking notes about your diet, check back through the pages to see if you can determine a pattern between the times when your face was the reddest. Sometimes, redness of the cheeks and face also bring inflammation and a burning sensation. A cold compress can help to soothe the burning sensation and help to reduce the swelling by shrinking the blood vessels underneath the affected skin. Simply dunk a face towel in a bowl of ice water. Give it a light squeeze and let the towel sit on your face until you need to wet the towel again. You can also use ice cubes to achieve the same results. Place up to four ice cubes in a face towel and apply it to the affected area in 5 minute increments. Let your face rest for 5 minutes before reapplying the ice pack. There are a few herbs that are known to reduce inflammation and provide relief fast. To name a few, you can use licorice extract, turmeric, feverfew, ginger, magnesium, and green tea. You can add these to your face mask or your ice water compress solution and allow the nutrients to soak into your skin. Unfortunately, many people don’t know how to get rid of red cheeks. Instead, they tend to cover up the excessive redness with more products. This method results in more products, time, and money. Here’s a few tips you can use to help to prevent red face. Avoid unnecessary lingering in the sun, heat, extreme cold, and aggressive wind. Drink alcohol sparingly or not at all. Be aware of that red wine is specifically known for triggering rosacea. Keep away from hard cheeses, chili and other spicy foods. Fragrant products, such as perfumes, soaps, and lotions, can trigger redness and rosacea as well. Witch hazel and more aggressive oils such as menthol, peppermint, eucalyptus oil and products with alcohol such as face cleansing swabs should also be removed from use. What you eat largely affects your body and your skin. Avoid processed foods and foods that are high in salt. Instead, hydrate your body with water and sports drinks with electrolytes. Nourish your body with foods that contain antioxidants, vitamin C, and vitamin E. These nutrients help to bring life your skin by repairing red, raw skin that is wind-chapped, sun-burned or dry and inflamed. Foods that you’ll want to eat are carrots, broccoli, sweet potatoes, and oranges. Emollients, such as coconut oil, olive oil, almond oil, and shea butter, all trap moisture in the skin. You can find these oils in creams as ingredients or you can apply the oil lightly and directly to the face. If you must go outside into a hard extreme weather and wind, a thin coat of Vaseline on the face can protect it from drying out. It also protects your face by taking the brunt of heavy wind or sand particles. Vaseline can also reduce the expansion of blood vessels during cold temperature conditions. Using a scarf to protect your face is another option. Before you step outside, wrap your nose and cheeks with the scarf. Make sure to thoroughly clean your face to remove all the Vaseline before bed so that you don’t clog the pores and create more redness by morning. Apply sunscreen before you leave your home as well. Even on an overcast day, UV rays can still damage the skin. Make sure that the SPF blocks rays of the UVA and UVB kind. Sunscreen that is noncomedogenic is best because it means that it won’t clog the pores. Take care of your skin when cleansing or exfoliating and with the aftercare. Cleansers that contain drying agents or alcohol can produce red, dry skin. When exfoliating, remember to rub the face gently and in circular motions. It doesn’t take much for the dead skin to be removed. A common mistake is being too intense with hygiene. It’s recommended to wash your face daily, even two times a day. Exfoliation only needs to happen once a week or you’ll be taking off much needed skin, leaving thinner, more delicate skin that is more prone to irritation, dryness, and redness. When you are done cleansing or exfoliating, pat your face dry. Don’t scrub as this can produce the same effects of over-exfoliation. Follow up with a moisturizer. You can even store the lotion in your refrigerator. This way, it’ll be cold when you apply it, and will further help to constrict the blood vessels and reduce redness. You can’t control weather conditions but you can dress for the occasion. In addition to this, finding the balance in your diet and having a steady facial hygiene routine goes a long way in eliminating redness. Red cheeks can be your body’s way of saying it needs attention. By participating in a healthier lifestyle, your skin benefits and so does the rest of your body.